Prick aubergine with fork in several places and grill over an open flame turning frequently till it blackens and blisters, feels soft and has a smoky flavour. Peel skin and mash to a smooth paste. Sauté garlic paste in oil. Add tahini and cumin, add lime juice and mix well. Drizzle with olive oil and sprinkle with parsley. 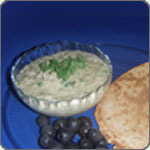 This Middle Eastern dish is served with black olives and pita bread, but plain Indian khakra may be substituted.